We were invited to participate in the third annual San Marino Motor Classic last Sunday at Lacy Park in San Marino, CA. Ed and Nora and I left San Diego county early on Sunday and an hour and a half later we were pulling up to the park entrance where we were greeted by an army of volunteers and vectored into the park in a very efficient manner. It took no time at all to get in, get our participant packet and be photographed! 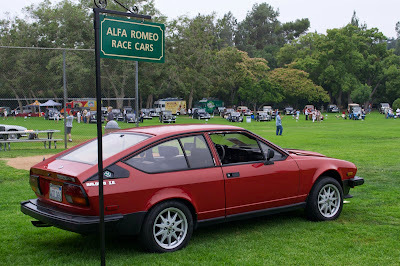 As we drove around the green several volunteers and other workers recognized and gave thumbs up to the Alfas. Once we were parked in our designated spot, the designated volunteers showed us the VIP tent where the complementary breakfast was available, where the nearest rest rooms were (real rest rooms with working plumbing, no porta-potties!). It was very well organized and really made us feel special. Hope we get invited back next year.